BOONE, N.C. — The column bore the title “Curtain Call.” It was 1986 and and I working as a sports editor in the resort town of Ojai, California. Over the course of the prep volleyball season, I watched every point as Nordhoff High School marched towards its goal of a state championship. I couldn’t help but consider the similarities as I witnessed the Appalachian State women’s basketball team before a small, but boisterous crowd of 1,293 at the Holmes Convocation Center on Saturday night in a 70-57 victory over Campbell Saturday night that vaulted the Lady Mountaineers into the championship game of the Women’s Basketball Invitaional. This remarkable group of young ladies from 1986 were scheduled to host Thousand Oaks High in the CIF Southern California Division II Regional Championship on the Saturday after Thanksgiving, with the winner advancing to the state title match a week later at Cal State-Fullerton. It was going to be the final home appearance for most of this remarkable group of young women, who had turned Nordhoff into a nationally-ranked, volleyball powerhouse. In my column that week, I suggested to readers that he proper send-off for this talented team was to pack the Nordhoff High gym to support the Lady Rangers. I didn’t think much of that column as I made a four-hour drive that afternoon and evening from covering the state high school cross country championships in Fresno, California to Ojai. But when I pulled into the parking lot, I was flabbergasted to see the Nordhoff campus filled with cars and a line of people waiting to get into the gym. A standing-room-only crowd had made its way to the school to honor and cheer on this special team. Fans were even packed on the theater stage at one end of the gym, several people deep. Inspired by this tremendous show pf support, the Lady Rangers took all of 40 minutes to dispatch Thousand Oaks in three lopsided games and a week later Nordhoff needed only three games to defeat South San Francisco High for a well-deserved state title. Local sports fans have a similar opportunity on Wednesday night and should make every effort to take advantage of this special moment. Those three consecutive titles in the Football Championship are permanently etched in the memories of everyone who witnessed the incredible games that another special group of athletes brought the High Country community. I am reminded of them every night that I cover ASU, basketball, sitting next to ESPN Plus color commentator Pierre Banks — one of the heroes of that Mountaineer championship era. Banks and I are constantly trading war stories from those days and nights when we meet up and they never get old. The Lady Mountaineers have their own cast of characters and set of heroes. How can you not appreciate the passion of coach Angel Elderkin, who has survived breast cancer and has transformed the women’s basketball program from eight to 20 wins in one season after constructing things the right way in her five years with the program? The personable Elderkin unleashes a seemingly endless bundle of energy on the sideline every night, but has been even more demonstrative during this journey towards a championship. Senior leader Made Story has etched her name into the record books as one of the all-tae greatest women’s basketball players at App State. She has relished every moment of her senior season after suffering an ACL tear last season that she now calls a blessing in disguise. Story put her team on her back during the crucial moments of Saturday’s victory, scoring 16 of her game-high 19 points in the second half and displaying raw emotions on the court as she almost single-handedly willed her teammates to victory. Junior center Bayley Plummer has become one of the top rebounders in the country and is a stalwart in the middle of the Lady Mountaineer defense. Plummer’s quick smile and enthusiasm is contagious. Plummer had 20 rebounds and 14 points in the semifinal, one game after matching her career-high with 21 rebounds in the quarterfinal win over Marshall. The postseason has been like an awakening for sophomore guard Pre Stanley, who has finally become confident in her immense talent and has dared opposing defenses to try and stop her. Stanley was a force in getting Appalachian off to a quick start against Campbell and finished with 15 points. There is the international flavor of Canadian point guard Ashley Polacek, Australian backup guard Nicola Mathews and injured senior Anna Perez Gomez from Spain. Sophomore forward Lainey Gosnell has blossomed with her three-point shooting and defense this season, while Tierra Wilson has been a key contributor off the bench. 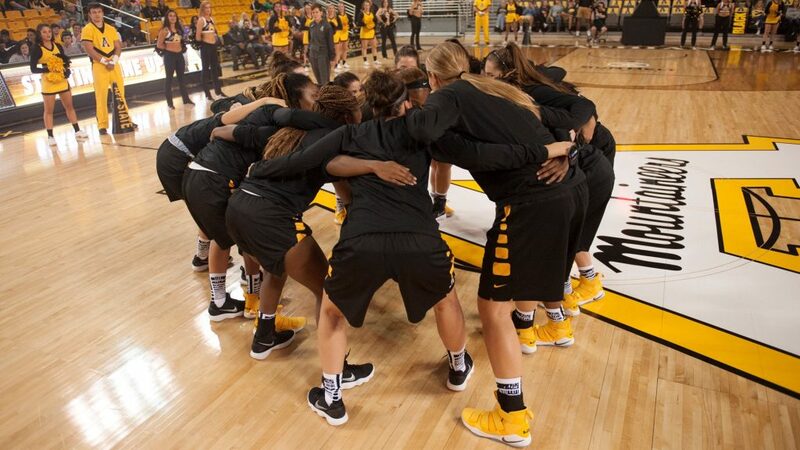 Quite frankly, this is the most entertaining women’s basketball we have witnessed in Boone since the Linda Robinson-coaching era in the mid-1990s. Those players and everyone else on the roster deserve a big sendoff to an unexpected championship run on Wednesday night at 6:30 p.m. when they play North Texas for the WBI with a title at stake. Wouldn’t be great to see fans lined up at the Holmes Center on Wednesday evening like I witnessed at Nordhoff all those years ago?